A day spent on a boat, touring islands just off the coast of mainland Thailand was the day we were all most excited for in our trip. During my research in advance of our vacation, I definitely knew it was possible to go on boat tours of the nearby islands, but I could find little specific info on how to book a tour or how much tours generally cost, so we weren't quite sure if it would be possible or within the trip budget, but we figured we'd work it out once we arrived in Trang. On our first night, we walked around to a couple different tour operators and got quotes on prices for tours. Based on my research, I was really hoping that we'd be able to get a private tour, as I'd heard that joining a 'big boat' tour can be a more frustrating experience, since you're crowded in with dozens of other people and have to stay on their time schedule. After asking around, we ended up booking a private tour for our family on our own longtail boat. The cost was 900 Baht (about $25 USD) per person, so this was our major splurge of the trip. It's worth noting that the ticket price + additional fees that we were quoted for joining a 'big boat' tour was also 900 Baht per person, which meant, for the size of our family, it was no more expensive to hire our own boat, and I'm very glad we did. We booked our tour for the 3rd day of the trip, leaving us all in eager anticipation of the fun adventure that lay ahead. We were due to leave in a van at 8:30 in the morning, and, as is usual for us, we showed up at the tour operators' office at 8:10. We're eager like that. One of the few gigantic families you'll ever meet who is routinely early to everything. 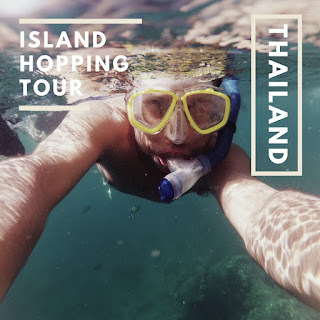 Our tour was scheduled to include a stop for snorkeling at Koh Chuak, snorkeling at Koh Kradan and lunch on the beach, and a visit to Emerald Cave at Koh Muk along with some snorking off the coast of Koh Muk. Have I mentioned that most of our family has never snorkeled before and a good portion of us have little-to-no experience swimming outside of a pool? Great. I was very excited but let's just say I was glad for the existence of life jackets. In our family, Angel is very comfortable swimming in oceans--the surfer boy from California, of course. Mom is also a great swimmer, she grew up swimming and snorkeling in Lake Huron--but she had a little 'barnacle' in the form of Sarah attached to her at all times. Rebekah and Dad can hold their own. I'm not terribly athletic and kept choking on ocean water when the mouthpiece of my snorkel came apart from the breathing tube, but I survived and was only a bit sore the next day. We tease MaryGrace about being accident-prone and our sweet sister returned from the day with feet rather sliced up because kept accidentally bumping them into the rocky coast of the island. All that to say--successful snorkeling actually requires a little bit of coordination and athletic ability, and Angel probably had the best time of all of us because he was best equipped. We did see other people out and about with toddlers in the ocean but for very protective parents, this would probably be a very nerve-wracking experience. Sarah can swim, but the wind, currents, and waves were a bit too much for her to fight against, which is why she stayed attached to Mom and in a life jacket the whole time. 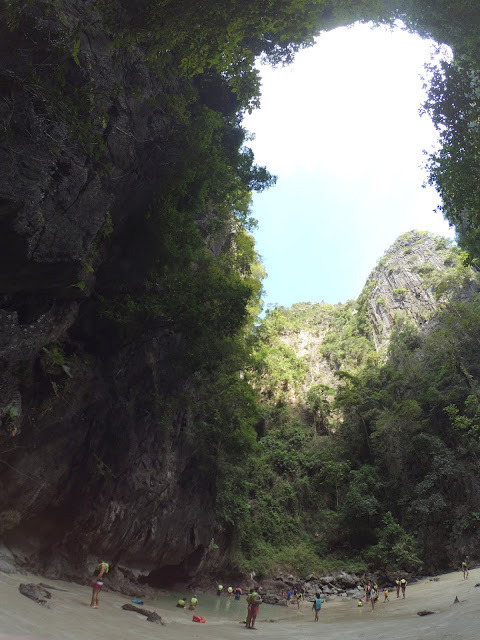 Before our vacation, we'd all heard of the famous "Emerald Cave" or "Morakot Cave" on Koh Muk. What makes this cave cool is the fact that the only way to get inside is to swim in or kayak through the little inlet from the ocean that goes through the cave. Once you get in, you're in a little sheltered beach area that is surrounded on all sides by rocky cliffs. It's incredibly surreal--so cool to realize in real life that places like that exist on our planet! This is such a famous place that there was a number of people around in this area--we went at around 3-3:30 in the afternoon. Our tour guide said there might be up to 200 people in Emerald Cave during the morning busy rush when big boats come--I don't know how true that is but if so...I'm really glad we were there with only about 50 other people around. 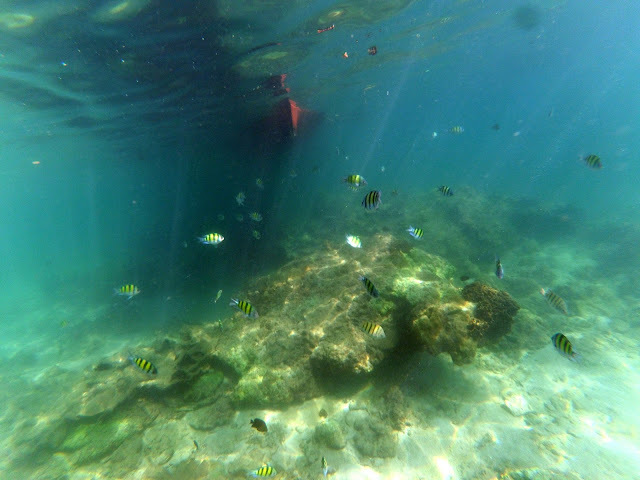 Snorkeling near Koh Muk and Koh Kradan was a different story, though. In both of those places, we were the only snorkelers in the area and it was quite peaceful, with very clear water. 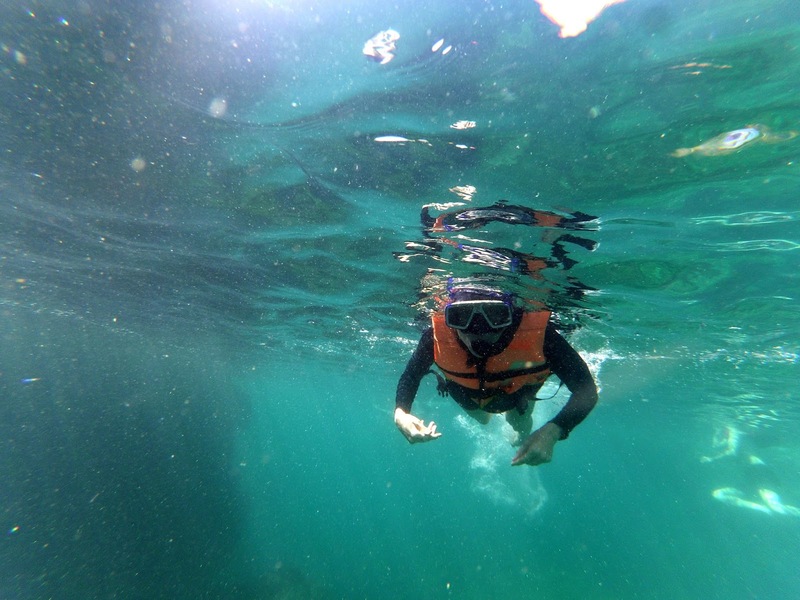 Highlights were spotting sea urchins, sea anemones, an angelfish and some very large clam-like creatures. Koh Chuak was busier, a number of other snorkelers were present. You might be able to tell by now that this introvert is always happier when crowds are light or non-existent. That's true, but at the same time, the fact that there were other people swimming around did nothing to take away from the adventure and wonder of it all. It wasn't noisy because most people were pretty intent on looking through their goggles at the underwater world below. The funniest part was just after we'd all gotten in the water when our family was in a group, getting the hang of the snorkeling gear, and suddenly I hear Sarah begin to scream through her snorkel--a fish had decided to get a little too close for her comfort. By the way, I have no idea what all the black and yellow striped fish that we saw by dozens are called. Do you happen to be a fish expert and know their name? I'd like to know but don't know an easy way to find out. We ate a boxed lunch on the beach at Koh Kradan ('we' being everyone other than me...I don't eat when I'm adventuring) and then some of us took a long walk down to a deserted area of the beach with some tree swings while Sarah and Mom built some sand creations, including a mermaid tail for Sarah. At the end of the day, our guide got out plates of fresh watermelon, which tasted heavenly after a day spent in the salty sea! Speaking of salt water...if you have curly hair, tie it up as tightly as you can before embarking on an adventure like this, and just plan on looking rather ridiculous for the rest of the day as your hair endures the combined terrors of salt and wind. Mom brought a pick with her and combed out tangles in her straight hair throughout the day and managed to look like a movie star, but for the rest of us curly-haired girls, I don't think a pick could have even done the job without the aid of conditioner. Speaking of conditioner--make sure you have packed some along. I didn't have any and at the end of the day I was using body lotion in my hair in the shower for detangling effect. Also, a full day in the sun and sea is brutal on bleached hair dyed purple--I had to color my hair as soon as we came home from the trip to get it nice and bright again. Moving from hair to skincare, at some point in the day we joked that we were like the "vampires" of tourists in Thailand, because while bikins and sunburns were prevalent among the others we spotted, most of us were wearing suit with sleeves and were reapplying sunscreen dutifully every time we got back in the boat. My swimsuit top is actually long sleeved, and I was glad of that, as it got a bit chilly when the boat was speeding away after picking us up from snorkeling. But I did not see anyone else out there wearing long sleeves. Our "vampire" tendencies paid off, though--I didn't get even a hint of sunburn. My beauty school textbook said that sun damage is the cause of 80% of visible signs of aging in skin--yeah, I'm diligent! :) MaryGrace, Dad, and Rebekah got slightly sunkissed...and Angel, the only one who wasn't wearing a swimming top or life jacket and wasn't as faithful about applying sunscreen, got the only actual sunburn/tan lines. Tiny islands are some of my favorite things on this planet. What are you favorite things to see and do on vacation? Your pictures are beautiful. I especially love the underwater shots. It looks so beautiful and brings back so many memories of when we did the Kilim side in Malaysia. It's the same kind of scenery and amazing blue waters. Ahhh would love to go back one day! You just reassured me (if needed) that Thailand is really a place I want to visit! Thanks for sharing! Sounds like such a cool adventure! I sort of forget that Thailand is such a tropical country, I have no idea why but it sort of slips my mind until I see photos. Beach hair either ends up doing great things for my sort of curly, but not real curls hair or terrible, terrible things depending on which way the wind happens to be blowing! How fun! I've never been to Thailand before, but want to go now. Your pictures are beautiful! I love traveling myself to far away places, but when i can't do that, looking at other's amazing pictures will do. It looks like it was a great excursion and well worth the money! Wow, this sounds so cool! The cave looks especially epic. This looks like so much fun! You have beautiful photos and the area looks like it's bursting with natural wildlife and beauty. I loved seeing the photos of the crabs. Wow, the colour of that water is amazing and so inviting! What an incredible experience. You are so lucky! This looks amazing! Just the colour of the water! WOW!!! That sounds like an amazing adventure! Wow! This sounds like a perfect day. So amazing! This sounds like such an amazing trip!! I've always wanted to go to Thailand. I love your photos! I love snorkeling! You`re right though, a bit of athletic ability is required (especially if the ocean is rough!) - in calmer waters or on beaches it`s mostly just tiring after a while with all the kicking. Your pictures are great! Also don`t worry about feeling like a vampire, I don`t ever snorkel without a full length tshirt on to block the sun, after one particularly bad back burn when I was a teenager, I KNOW it`s not worth it! Thailand is beautiful! I would love to visit some day! Snorkeling is at the top of my bucket list!